Egypt Tombs - HISTORY'S HISTORIESYou are history. We are the future. If you moved away tomorrow, what would you take with you? More, what would you want your new home to look like and how much space would you need to hold all of your things? The ancient Egyptians thought about those questions quite a lot, likely from an early age. By doing so, they were readying themselves for their afterlife. A great deal of what we know about ancient Egypt comes from what archaeologists learned by studying tombs. A tomb is a place in which you are buried when you die. The ancient Egyptians believed that life did not stop when you died. Rather, death was more like a temporary stop on your way to another place, a place they called the afterlife. During the Old Kingdom, however, only pharaohs could hope to move onto the world of the afterlife. Tombs varied according to social class, but all served the same purpose - to provide a home when one entered the world of the afterlife. When a pharaoh died in ancient Egypt, the pharaoh was buried in a royal tomb. During the Old Kingdom, royal tombs were located inside huge structures called pyramids. Although the common people were sad about not being able to move on to the afterlife, it gave them great pleasure to build the pharaoh's pyramids. Throughout the Two Lands, Upper Egypt and Lower Egypt, it was understood that building a pyramid was a sign of love and respect for the pharaoh. For the ancient Egyptians, building a pyramid was like building the pharaoh a new palace, one that he would call "home" in the afterlife. While the ancient Egyptians believed that their pharaohs moved on to a new palace in the afterlife, they also believed that their pharaohs would very much remain a part of their everyday lives. From the afterlife, it was believed, the pharaohs would still keep an eye on the welfare of their people in their old neighborhood. The Pharaoh's Afterlife: For the ancient Egyptians, the afterlife was a place that greatly resembled Egypt. Consequently, when they built their pharaoh’s tomb, they wanted it to be beautiful and comfortable. That way, they could be sure that their pharaoh could enjoy his afterlife surrounded by the things he loved. Thus, the inside of a pyramid was built like a palace. Building a pyramid was a really big deal. It took time and planning. The very first day a royal was crowned as Pharaoh, work on his or her tomb began. The day a pharaoh married, work on his wife’s tomb was begun. Inside the pyramids there were courtyards, storage rooms, lofty halls, and secret passageways. The walls of each room were covered with wonderful paintings like those seen at left, relief sculptures, and hieroglyphic writing that told about the life and times of the person buried inside. 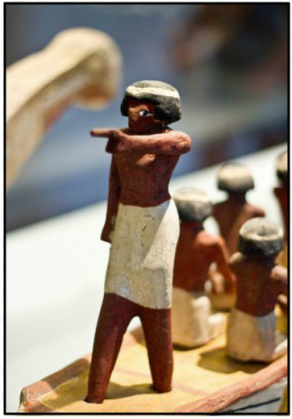 The rooms were filled with beautiful statues and clothes and gold plated toys and games and trinkets and jewelry, and anything else the pharaoh might want to have on hand in his or her afterlife. What is a shabti and why were they included in Egyptian tombs? There were little statues that represented his wife, children and friends, so his loved ones would be close to him. 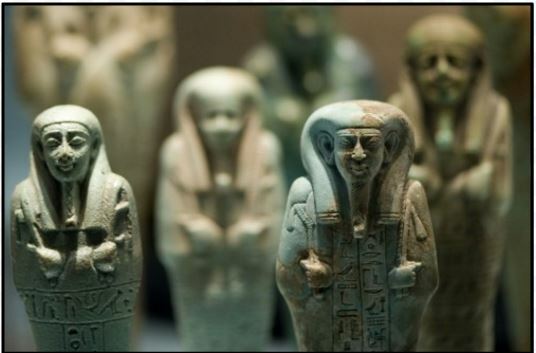 So that the deceased could enjoy the afterlife, they also had shabtis buried with them. Shabtis were statues that represented workers. Shabtis did the heavy lifting and served the dead in their afterlife existence. "Here I Am", you shall say,"I Shall Do It". Shabtis were the workforce of the afterlife. One room in the pyramid was especially important. That room was the burial chamber. The burial chamber is the name of the room that held the sarcophagus, the stone coffin that held the mummy of the pharaoh. There was always a cartouche on the sarcophagus. A cartouche is simply an oval design. In the middle of the oval, the pharaoh’s name is written, rather like a nameplate. The ancient Egyptian believed if your name did not appear in writing, you would disappear and never reach the afterlife. The Pyramid Economy: Building the pyramids provided plenty of jobs and pay. During the Old Kingdom, the pay was not in money. It was in grain. Essentially, the workers were paid in bread and beer. For three months every year, when the Nile rose and ebbed, the farmers had nothing to do. What could they do for work? What could peasants do to avoid being bored? One thing many of them did was enroll in the royal work force and work on the pyramids. Pyramids, however, didn't always look like those we see at Giza. In fact, as building techniques advanced, pyramids evolved greatly over time. Pyramids trace their DNA to the tombs of early pharaohs. Those tombs are called mastabas. The word means "eternal home." Mastabas are low, flat topped rectangles with outwardly sloping sides. They look a bit like someone built the foundation for a pyramid but got tired of the project and walked away. Looking at a mastaba, however, it's easy to see how that structure evolved into the pyramids we know. In between the construction and use of mastabas and pyramids, however, the step pyramid was used for royal tombs in Egypt. The step pyramid was pioneered by an assistant to Pharaoh Djoser in the 27th century BCE. The name of Djoser's assistant was Imhotep. Imhotep seems to have been a gifted jack-of-all-trades. He is often credited with being the world's first architect. However, he was also a physician known for extracting medicines from plants, as well as an engineer. What was Imhotep's contribution to pyramid construction? Imhotep was so multi-skilled that his full title was "Chancellor of the King of Egypt, Doctor, First in line after the King of Upper Egypt, Administrator of the Great Palace, Hereditary nobleman, High Priest of Heliopolis, Builder, Chief Carpenter, Chief Sculptor, and Maker of Vases in Chief." Imhotep used his architectural and engineering skills to create Djoser's tomb. To do so, he essentially stacked several mastabas on top of one another, thereby creating the step pyramid at Saqquara most closely associated with his work. Most of the pyramids built during the Old Kingdom are clustered together on the west bank of the Nile near Memphis, ancient Egypt's old capital. The three pyramids at Giza are the most impressive. King Khufu's Great Pyramid of Giza stands at 455 feet high and has over 2 million stones in it, each stone weighing about as much as a modern-day automobile. Building a Pyramid: The Egyptians did not have heavy machinery to do their lifting. All their monuments including the pyramids were built by hand. Big blocks of stone were brought by boat, often from mountains in distant southern Egypt. At the construction site, teams of men dragged the huge stones up ramps and used mud and water to slide the stones into place. Slowly, the walls grew. Workers kept building ramps higher and higher, dragging stones with them. Really, it was a pretty incredible achievement. When the pyramid was finished, the royal work force worked backwards, taking down all the ramps as they finished the artwork on the interior walls and finished smoothing stones into place. With a great deal of pomp and ceremony, the pharaoh was laid to rest inside his pyramid, in the burial chamber, in his sarcophagus. The last step was to close the final door into the pyramid. The location of that door was a secret known by only a few people. Outside the pyramid, a whole city had grown, just as they did later when workers built the tombs of pharaohs in the Valley of the Kings near Thebes. The pyramid-cities were the homes of all the people who worked on the pyramid. The homes provided by the pharaoh for the pyramid workers were very nice. Each family had their own home. Each home had a small courtyard with a ramp leading to the second floor flat roof, where the family could gather to catch the breeze and watch the sunset. There was also a room, sometimes two rooms, inside the house for privacy and for cold weather. Why did people live in the pyramid-city after the pharaoh was entombed? ​After the pharaoh was buried, the workers continued to live in the homes the pharaoh had built for them during his tomb's construction. They still had a job to do. The pharaoh also left behind money to pay the priests to say prayers for him and to grow food to pay the workers who kept his new palace in good repair. In exchange, the workers swore never to reveal the traps or secret passageways or hidden doors that led inside the pyramid. Robbers, of course, were especially interested in what was inside each tomb. To confuse robbers, each pyramid was built differently, and all were full of false doors, deadly pits, and wandering passageways that led nowhere. Those things were built to confuse and lose robbers in the vast interior of a pyramid. Of course all of that design, deception, and trickery did not stop the robbers. In the end, the robbers found their way in, stole what they could, and smashed much of the rest. While they are fabulous structures, for sure, representing a mastery of engineering and large scale construction, majestic today and unparalleled for their time, it is still a mystery why the early rulers of Egypt began putting their tombs inside pyramids? Was it a test to see what grand feats they were capable of completing, or was it simply a statement of power - or of fashion? The truth is, we may never know. How did the Egyptians view the afterlife? Everyone Deserves an Eternal Home: While the tombs of the pharaohs were special, it's important to remember that at the time they were being built not everyone could enter the world of the afterlife. Things changed, however, when the democratic god Osiris became the Egyptian god of the afterlife. 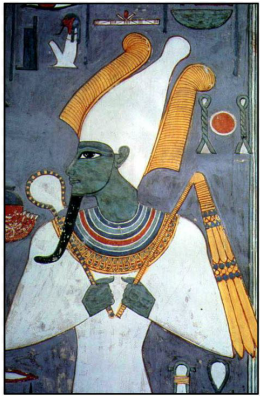 Osiris decreed that all people had the right to enter the next world, the world of the afterlife. For the Egyptians, the afterlife was not an eternity spent above the clouds. Instead, it was the "Field of Reeds" (along with Lily Lake and the Field of Plenty), a place that mirrored their life on earth. In fact, the afterlife for the Egyptians was more like an eternal Egypt, a perfect reflection of the life they lived. Among commoners who loved their life along the Nile, the idea that they could enter the world of the afterlife was cause for much rejoicing. Hall of Maat: Before the ancient Egyptian commoners could board Ra’s boat and sail into the heavenly world of the afterlife, however, they first had to pass a test. Actually, it was more like a trial, and it was conducted by the gods in the Hall of Maat. Maat was the goddess of truth and justice. What ceremony took place in the Hall of Maat? Really, it was a simple test. Maat, the goddess of truth and justice, had a set of scales balanced by two pans. In one pan, she placed her magic feather. In the other, the heart of the deceased was placed. Next, the jackal-headed god, Anubis, weighed the heart while the ibis-headed god, Thoth (Maat's husband), served as judge and scribe and stood by to record the results. If it was your turn to take part in the Weighing of the Heart ceremony in the Hall of Maat, and if your heart was found to be as light as a feather because your deeds during your life were good and pure, the scale balanced and you passed the test. If you passed the test, Anubis, guardian of the underworld and keeper of the scales, would guide you to the afterlife where you would live in the Two Fields, the fields of peace, with the king Osiris, free to cruise the Nile, surrounded by friends and loved ones, forever. If, however, your heart was heavy because your deeds were dreadful, the god with the head of a crocodile, Ammut the Devourer, would suddenly appear and eat you up. A Lifetime of Collection: In preparation for their move to the afterlife, the ancient Egyptians spent a great deal of time building their tombs. They spent a lifetime collecting together their grave goods, the things they wanted to be included in their tomb. Since they were moving to the afterworld forever, they wanted to be comfortable. They made little statues of workers, and packed those away. They wanted little workers on hand so that when they were called to do their share of work caring for the Two Fields, they could send their little workers instead, leaving them free to sail the heavenly Nile or visit with friends who had entered the afterlife. They packed toys and light reading; they set aside their best clothes and their best jewels to be packed in their tomb with them once they died. They collected everything they wanted to bring with them, and they did this their whole life. Their notion of a happy family outing was a visit to the family mausoleum to see how work was progressing on their tomb. Getting oneself ready for the move to the afterlife was part of ancient Egyptian daily life. It was not a gloomy part. It was a joyous part. Even the peasants prepared for the afterlife. Perhaps they could not afford an elaborate funeral, but they spent a lifetime creating tiny miniatures of the things they wanted to bring with them into the afterlife. Thanks to Osiris, the door to the afterlife was open to everyone, provided his or her heart was light. Why were wall paintings included in Egyptian tombs? Wall Paintings: The best artists were reserved for the tombs of the pharaohs and nobles. For those who could afford it, however, it was important to cover one's tomb walls with colorful paintings of daily life, along with prayers and poems of praise about the many accomplishments of the owner. A tomb's wall paintings portrayed the deceased in the way he or she wished to remain forever, usually accompanied by images of family and servants. By putting scenes of an idealized life on their tomb walls, the Egyptians believed that the pleasures of life could be made permanent. These forms of art not only reflect the Egyptians' love of life but also, by their very presence, made the afterlife a reality. ​The painting to the right depicts a man named Menna hunting in the Nile marshes. Menna is the largest figure and is shown twice. He is spear fishing on the right and flinging throwing sticks at birds on the left. His wife, the second-largest figure, and his daughter and son are with him. By their gestures they assist him and express their affection. The son on the left is drawing attention with a pointed finger to the two little predators (a cat and an ichneumon) that are about to steal the birds' eggs. Pointed fingers were a magical gesture for averting evil in ancient Egypt, and the attack on the nest may well be a reminder of the vulnerability of life. The poems of praise were not written solely out of vanity. They were an essential element of the tomb. The ancient Egyptians believed that to exist in the afterlife, you had to have an identity - a name and a history. If you did not have an identity, if your name did not exist in print, you disappeared. So far, over 60 tombs have been found in the Valley of the Kings. ﻿Pyramids to Tombs: One problem with putting a royal tomb inside of a pyramid was that it was hard to hide a pyramid. That made it extremely easy for grave robbers to find a pharaoh's tomb. Even though the punishment for robbing a grave was slow torture and death, many robbers were willing to take the risk, especially when it came to robbing the pyramids. Grave robbers, then as now, always had people ready to pay good money for stolen objects. In ancient Egypt, those people were often nobles and priests. Today, stolen artifacts are often sold to private collectors, antiquities dealers, and sometimes even museums. Because of their propensity to be plundered, pharaohs stopped building pyramids and began building royal tombs in secret places. Valley of the Kings: All the pharaohs of the New Kingdom were buried in the Valley of the Kings or the Valley of the Queens, with the exception of king Akhenaten. (King Akhenaten tried to change the religion of ancient Egypt. After he died, all mention of his name was removed, scratched out of existence.) Hiding the tombs did not stop the robberies. Sooner or later, tomb robbers found the secret doorway into a tomb, broke in, and stole much of what was there. What is one reason that King Tut's tomb escaped destruction? King Tut's Tomb: The only tomb that escaped total destruction was King Tut’s tomb. 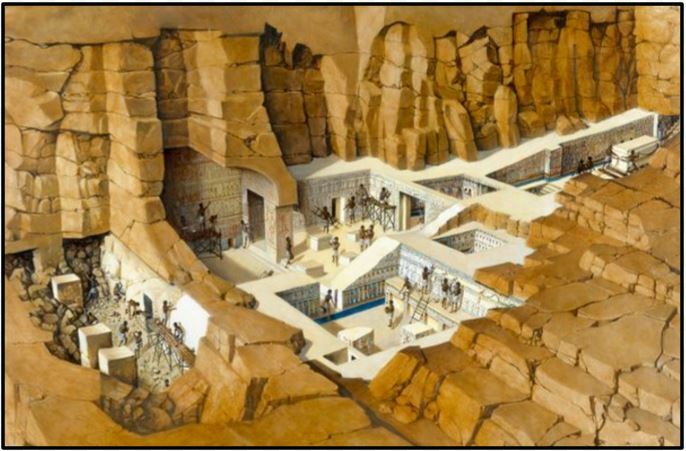 Tut's tomb was quite small by royal standards and it's size probably saved it from being found by tomb robbers. That’s why archaeologist Howard Carter's discovery of the tomb in 1922 was so important. When the tomb was opened, it was still full of the many treasures that King Tut had buried with him. Those treasures told a story about ancient Egyptian beliefs, religion, and daily life. Tut was only nine years old when he became pharaoh, and only 18 years old when he died. What is amazing about Tut's tomb is that very little care was spent collecting the objects with which his tomb was filled. Apart from the respect due him as a pharaoh, he was considered a puppet king, manipulated by his handlers during his rule. As a result, the Egyptians bundled some stuff together and placed it inside, and that was it. Yet to us today, what was found in King Tut’s tomb makes us gasp with wonder. His face mask alone (shown above) was made of solid gold and the gorgeous and precious stone lapis lazuli. The treasures Carter and his team found are on display today in museums. It makes you wonder what treasures we might have found in the tomb of King Rameses II or one of the other major pharaohs if they had not been robbed thousands of years ago. Recent research suggests that archaeologist's may be in for more surprises. Using radar imaging, scientists have discovered what appear to be doors hidden behind panels in King Tut's tomb. Current speculation centers on the possibility that those doors lead to the never-found burial chamber of Tut's mother, Queen Nefertiti. If true, there is little doubt that a trove of treasures awaits behind the walls of Tut's final resting place. The dilemma that scientists face is whether or not to risk the destruction of the priceless antiquities that are known for treasures that only exist in the realm of possibility. Pieces of the Past: Each tomb has a story to tell. Archaeologists spend a great deal of their time studying ancient Egyptian tombs, trying to read the pieces of the past.